Did Jesus Return in 1874? 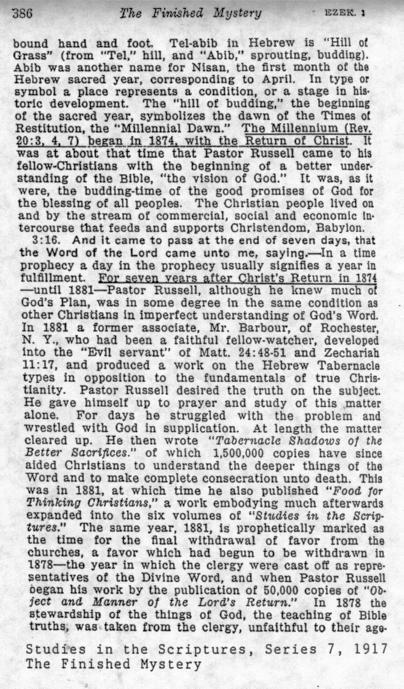 At the very heart of the Watchtower's gospel is the date 1914. Jehovah's Witnesses are taught that this was the year that Christ began his invisible second presence over the earth and is re-establishing God's Kingdom. 1914 is a date that Jehovah's Witnesses live and die with. The Society has gone through lengthy and complicated number crunching to "prove" its accuracy. The calculation is based on the destruction of Jerusalem by the Babylonians in 607 B.C., (historians believe that 586 B.C. is the actual date), and is "confirmed" by catastrophic events happening since 1914, such as World War 1. Has the Watchtower, however, always held to this year as the commencement of Christ's reign? Lets check back into the history of the organization to see. 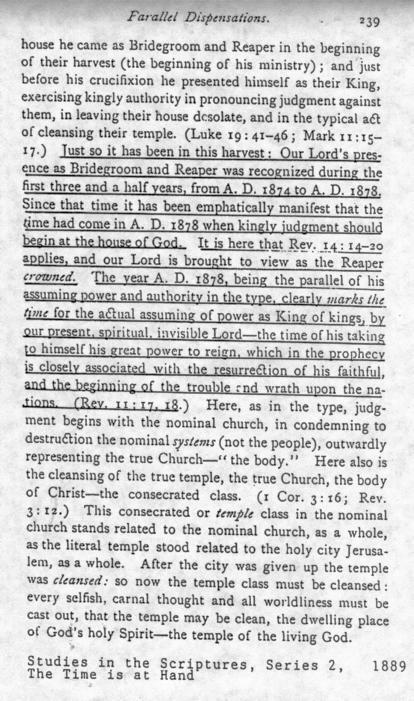 "Just so it has been in this harvest: Our Lord's presence as Bridegroom and Reaper was recognized during the first three and a half years, from A.D. 1874 to A.D. 1878." "....three and a half years after his second advent at the beginning of the harvest period, in the fall of 1874." "The Millennium (Rev. 20:3, 4, 7) began in 1874, with the return of Christ." 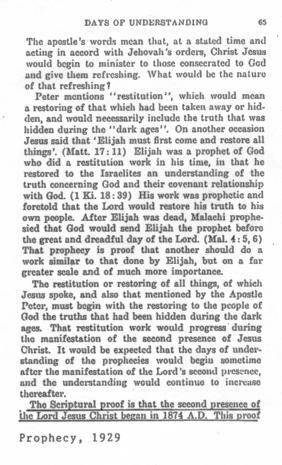 "No one can properly understand the work of God at this present time who does not realize that since 1874, the time of the Lord's return in power, there has been a complete change in God's operations." 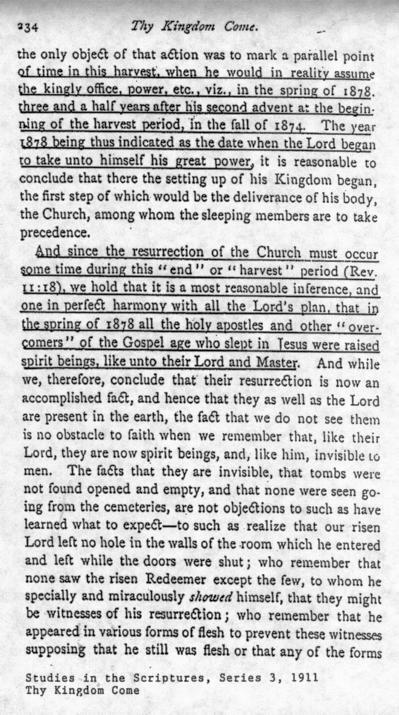 "Surely there is not the slightest room for doubt in the mind of a truly consecrated child of God that the Lord Jesus is present and has been since 1874...."
"To understand the events concerning the Lord's second presence from 1874 to 1914 requires one to be spiritually minded...."
"The Scriptural proof is that the second presence of the Lord Jesus Christ began in 1874 A.D."
So, the early publications of The Watchtower and Herald of Christ's Presence were not looking forward to 1914, but backward to 1874. My question is, if 1914 was really the beginning of Christ's second presence, how come nobody knew until at least 1930? Didn't even the first two presidents of the Watchtower Society know? If 1874 proved to be false, will 1914 go down along side of it? Already, in 1995, the organization dropped the 1914 generation as being the one who would see the end of this system of things (see 1914 generation article). 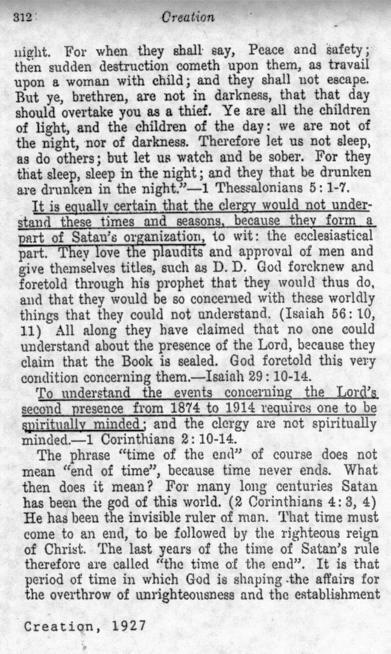 Most Jehovah's Witnesses have no idea that their cherished year 1914 was not believed in by their early brothers and sisters. Again, what's to keep this date from changing in the future? It is evident to the outside observer that the Watchtower organization has no solid foundation to stand on. One can never be sure that today's truth won't become tomorrow's error. However, the person of Jesus Christ is a guaranteed solid foundation. Jesus never told us to follow any organization, but said, "Follow Me" (Mt. 4:19). Will you repent of dead works and put your faith and trust in Jesus alone for your eternal salvation (Jn. 3:36)? Our prayer at this ministry is that you do. By doing so you will experience a relationship with God that you will never have as a Jehovah's Witness. May God Himself, the God of peace, sanctify you through and through (1 Thess. 5:23).